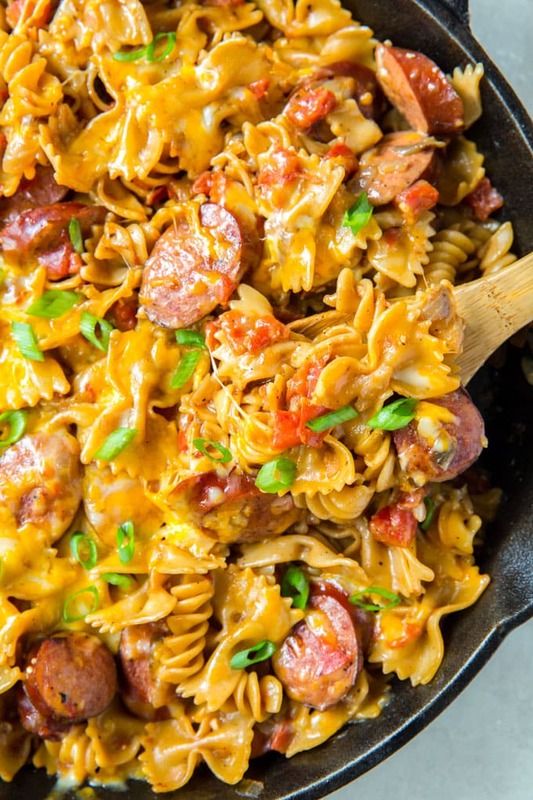 Creamy, cheesy, spicy and savory, this One Pot Cheesy Sausage Pasta meal has got it all! 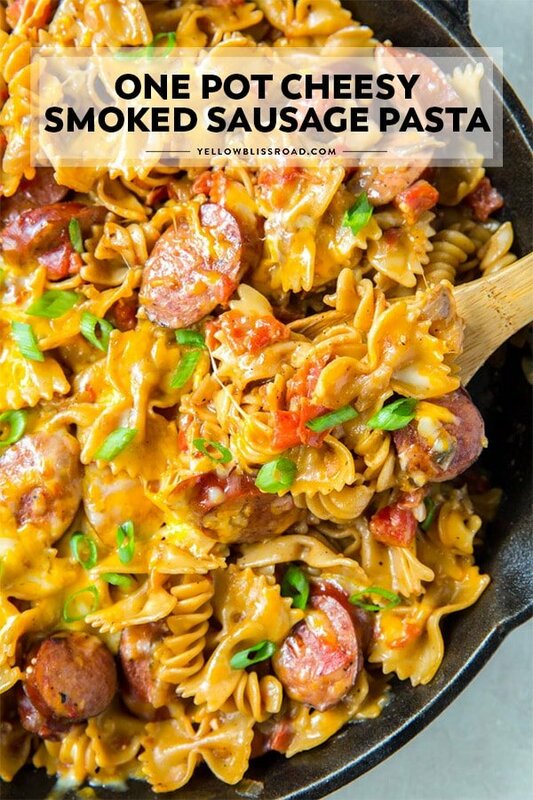 I am so excited to share this cheesy smoked sausage pasta skillet recipe with you today! 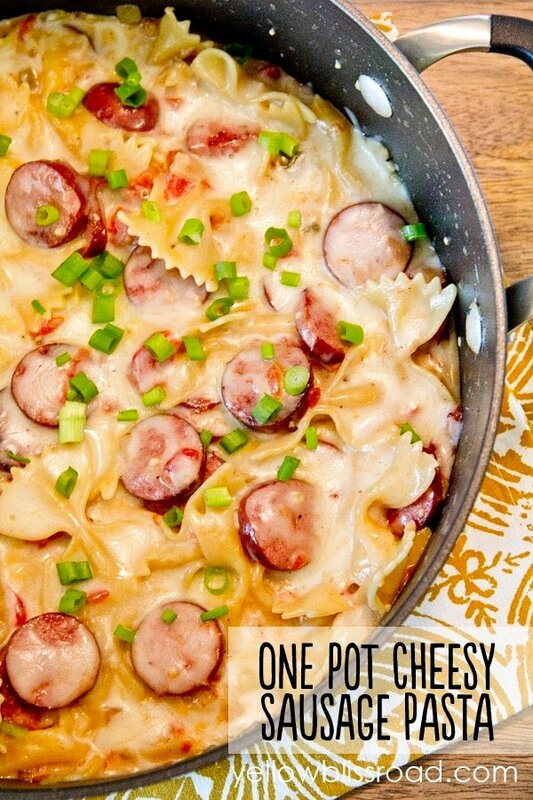 One pot meals are my favorite, and this one has just topped the list! 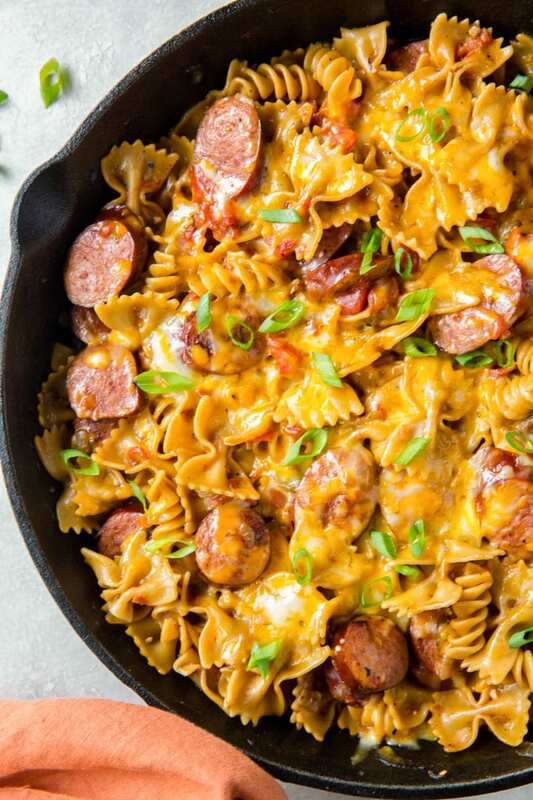 Savory smoked sausage, creamy melted cheese, fragrant garlic, onions and tomatoes…all come together in a one skillet meal that is sure to please everyone in the family! One Pot Meals are the best for busy families like mine because they are simple, come together in a flash and require minimal equipment and clean up. 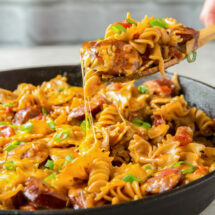 Some of our favorite one pot meals are One Pot Chicken Spaghetti, One Pot Creamy Chicken and Noodles and this One Pot Cheesy Smoked Sausage Pasta. The best part is it takes only about 20 minutes from start to finish. These one pot meals have become my go-to weeknight dinners. Pair with a salad and you’re good to go! I love smoked sausage, and it was perfect paired with the other flavors in this recipe. I can’t wait to create some more! The steps for this recipe are quick and easy. 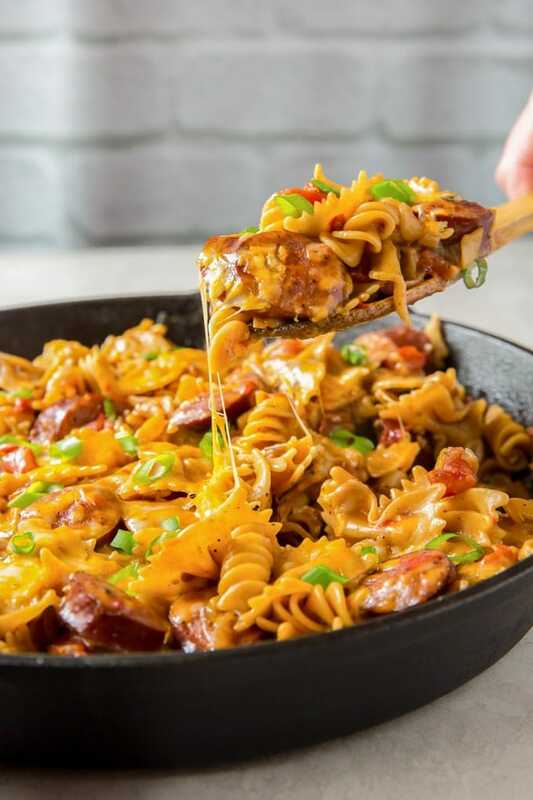 Saute your Hillshire Farm Smoked Turkey Sausage (or any brand will do) with some onion and garlic, then add a can of Rotel diced tomatoes, pasta, cream, chicken broth and seasons. It only takes about 15 minutes to cook – add some cheese and you’re good to go! Cook onions, garlic and smoked sausage in a large, deep saute pan and cook until lightly browned. Add chicken broth, Rotel tomatoes (or plain tomatoes, with or without chiles is your call), milk, pasta, and seasonings. Bring the mixture to a boil, cover it with the lid and simmer for about 15 minutes, or until the sauce is thickened and the pasta is tender. Turn off the heat and stir in 1/2 cup of sharp cheddar cheese. Sprinkle remaining cheese on top and cover for about five minutes to allow cheese to melt. Feel free to use your favorite melty cheese, like Mozzarella or Jack. Pepper Jack would add even more heat so that’s another great option. and that one is just as fabulous. Both are perfect for any of my one pot meals. We love to serve this sausage pasta with a simple green salad and maybe some fresh bread on the side. You could also add your favorite veggies to the mix, like zucchini or broccoli. WHAT IS THE BEST WAY TO REHEAT PASTA? Reheating pasta with a cheesy sauce in the microwave can be tricky. Add a couple of splashes of milk or cream per serving, then heat at 50% power for several minutes, stirring at one minute intervals. This will keep the sauce nice and creamy. There’s nothing worse than a cheese sauce that has become curdled and separates. If your pasta was not stored with a sauce, drizzle on a little olive oil before heating. WANT MORE SMOKED SAUSAGE RECIPES? 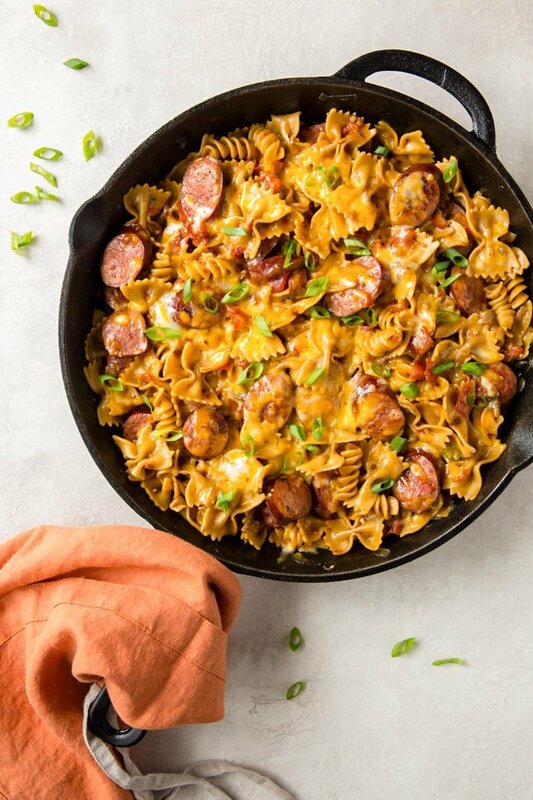 One Pan Cheesy Smoked Sausage Pasta recipe has smoked sausage and pasta in a spicy, creamy sauce that's all cooked in one pan for a quick weeknight meal. Add olive oil to a 5 quart saute pan over medium high heat. Add onions and sausage and cook until lightly browned. Add garlic and cook for about 30 seconds. Add chicken broth, tomatoes (undrained), milk, pasta, and seasonings. Bring the mixture to a boil, cover, and reduce heat to low. Simmer for about 15 minutes, or until pasta is tender and most of the liquid is absorbed. Turn off the heat and stir in 1/2 cup of cheese. Sprinkle remaining cheese on top and cover for about five minutes to allow cheese to melt. Top with sliced scallions and serve. (You could also broil for a couple of minutes to melt the cheese). *Adapted from America’s Test Kitchen Simple Recipes Cookbook. For a complete list of recipes on the site, be sure to go here. I’m not big on freezing dishes with cheese sauces, but if you let it cool and then freeze it, thaw it overnight in the fridge and heat it on the stove with a little added cream you will probably be good. Made it last night and it was very yummy and the perfect amount of heat for us. I have since put the recipe in my cute little recipe crate. My hubby says it’s a keeper! Thank you for sharing. I have lived this recipe for a couple of years… we always double it so we have leftovers! It’s a great base for me to jump off from and get creative! That’s what I love about recipes…. you can go whatever way you want to make them more your own. I need a little color and variety so I add a couple of red bell peppers cut into hunks and a bad of frozen peas…. and depending on my mood a little chili powder or paprika for a kick. Great idea, love that you made it your own Scott!